Sirius NASCAR Radio's Sirius Speedway with Dave Moody has learned that Trevor Bayne will drive a Roush-Fenway Racing #17 Ford in Saturday’s Kansas Lottery 300 NASCAR Nationwide Series race at Kansas Speedway. 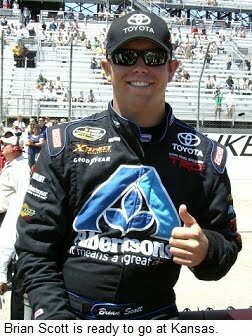 Bayne was released by Diamond-Waltrip Racing earlier this week after the team was unable to fulfill a contractual obligation by guaranteeing him a full-time seat for the 2011 season. Chad Norris will serve as crewchief for the effort. 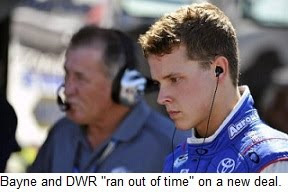 Bayne will reportedly drive the remainder of the season for Roush Fenway, and a team spokesperson said talks are currently underway concerning the 2011 season. Sirius NASCAR Radio's Sirius Speedway with Dave Moody has learned that Brian Scott will be back in action this weekend in the NASCAR Nationwide Series “Kansas Lottery 300” at Kansas Speedway, driving the #09 Ford for RAB Racing. Scott was released by Braun Racing earlier this week after the team’s sale to Turner Motorsports, but the Raybestos Rookie leader said he was confident that he would be able to find another ride for the remainder of the season. Scott was unavailable for comment earlier today, but RAB Racing owner Robby Benton confirmed that Scott will drive the #09 car this weekend, with sponsorship from Shore Lodge. "It all came together very fast," said Benton. "The guys in the shop pulled an all-nighter last night to get a car ready to take to Kansas, and we are hoping to have a good race with Brian. We've seen what he can do over the last couple of years, and we're happy to be able to help in in his pursuit of the Raybestos Rookie crown. That would be a nice bullet-point on our resume, as well." Diamond-Waltrip Racing has announced that Ryan Truex and older brother Martin Truex Jr. will share the No. 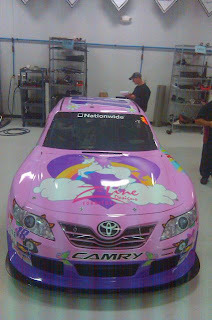 99 Toyota for the remainder of the 2010 NASCAR Nationwide Series season, replacing Trevor Bayne. The team will field two cars this weekend at Kansas Speedway; both with sponsorship from OUT! Pet Care. Ryan Truex will then run the Charlotte, St. Louis, Phoenix and Homestead-Miami races, with Martin Jr. racing at California and Texas. He also commented publically for the first time on the departure of Bayne, who placed the #99 Toyota solidly in the Top-10 in Nationwide points before being released this week. Bechtel said the issue was not sponsorship for this season, but a provision in Bayne’s contract requiring DWR to guarantee him a spot in their 2011 lineup. Bechtel called the issue “simply economics,” adding, “DWR held an option on Trevor’s contract, but without appropriate funding, we could not match the provisions of that contract extension by guaranteeing him a full-time ride in the No. 99 car next year. We could not commit to the demands of the agreement. Brian Scott has confirmed to Sirius NASCAR Radio’s Sirius Speedway with Dave Moody that he will not longer drive for Braun Racing, in the aftermath of the team’s recent sale to Turner Motorsports. Asked if reports that he has spoken with Joe Gibbs Racing about 2011 had played a role in the split, Scott said, “The NASCAR community is a very close community, and everyone has a feel for what is going on. There was some uncertainty about the ownership situation (at Braun Racing), and we were uncertain about what it meant for the end of this year and next year. So we went through the garage and asked some people what was going on, what could happen. We were planning for a worst-case scenario in case someone came in and shut down the team I was racing for. Scott said he is hurrying to put together a new deal to maintain his spot at the top of the Raybestos Rookie of the Year standings. “I’m very fortunate to have the people I have around me; from a family, management and manufacturer standpoint. The Raybestos Rookie deal is important to me and a lot of other people, including teams who know it would be a feather in their hat to have me finish the season in their cars. The phone’s been ringing a lot. While he would prefer to finish the season in a Toyota, Scott said the manufacturer understands that he may not be able to do so. “The best-case scenario would be to stay with them and finish the season,” he said. “But Toyota understands the urgency of the situation and that we may not be able to make that happen in the immediate future. It doesn’t sound like they’re totally opposed (to me driving for another manufacturer), knowing that we want to make it happen in 2011. 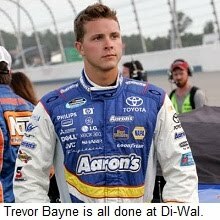 Trevor Bayne is out of the Diamond-Waltrip Racing #99 NASCAR Nationwide Series Toyota, creating an opportunity for Martin Truex, Jr. and younger brother Ryan to race against each other for the first time in Saturday's "Kansas Lottery 300 " at Kansas Speedway. Martin Truex, Jr., confirmed the change today, telling Sirius NASCAR Radio's Sirius Speedway with Dave Moody, "Trevor Bayne and Diamond-Waltrip Racing have parted company, and that opened up a seat in that car. Ryan and I will get to run against each other for the first time, and I'm looking forward to it." Sunday night at New Hampshire Motor Speedway, Clint Bowyer’s #33 Chevrolet was given a clean bill of health by NASCAR, as officials gave members of the media the traditional “all clear” pronouncement signifying that all competitors had passed their post-race technical examinations. Yesterday afternoon at NASCAR’s Research and Development Center, everything changed, and a lot of people don’t understand how, or why. A certain portion of NASCAR’s fan base has always believed the worst about the sanctioning body’s motives and morals. They point to Richard Petty’s fairytale 200th victory at Daytona as a prime example of NASCAR’s willingness to “fix” races. They point disdainfully at late-race “phantom cautions” designed to manipulate the outcome of events, and bemoan the mistreatment of “little guys” like Carl Long, who find themselves slapped with potentially career-ending fines while established stars like Jimmie Johnson get off with a comparative slap on the wrist. In their minds, the umpire is not simply incompetent, he is corrupt. Yesterday’s events only solidify that belief. Sprint Cup Series Director John Darby did his best to explain the difference between at-track technical inspections and the more exhaustive examinations done at NASCAR’s North Carolina R&D Center. 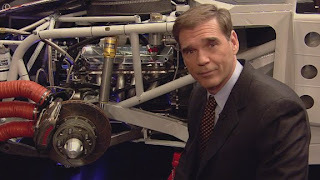 He explained that cars must be largely disassembled in order to obtain the measurements needed to determine the legality of Bowyer’s car; something that obviously cannot be done at the racetrack. He also revealed that Bowyer’s violation was similar to the one that brought the #33 team “hold-your-breath close” to sanctions the previous week at Richmond. That explanation did little to sway the tide of public opinion. People had already picked sides, many of them siding with Bowyer and his Richard Childress Racing team. 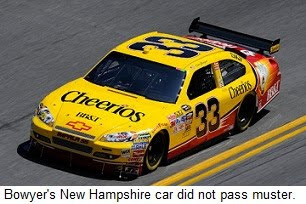 “It doesn't make any sense at all that we would send a car to New Hampshire that wasn't within NASCAR's tolerances,” said Childress Wednesday. “I am confident we fixed the area of concern and the New Hampshire car left the race shop well within the tolerances required by NASCAR.” He also raised the spectre of reasonable doubt, saying the rear bumper of Bowyer’s Chevrolet was hit by other drivers as they congratulated him on his cool down lap, and that the car was pushed from behind by a wrecker on its way to the Winner's Circle. Both instances, he claimed, could explain the .060 of an inch discrepancy allegedly found by NASCAR. In fact, he said, it was “the only logical way” for the left-rear corner of the car to be too high. Finding a race winner with an illegal car is increasingly rare in the modern era of NASCAR. During the Chase for the Sprint Cup, it’s downright unprecedented. An escalating series of monetary and point penalties has made the risk no longer worth the reward, or so we thought. Bowyer’s penalty changed all that. "It's not any easier on our part than it is on the competitor,” said NASCAR Vice President of Competition Robin Pemberton yesterday. And on that count, he is correct. 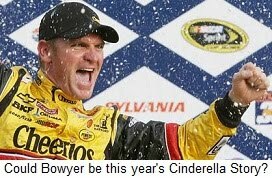 Yesterday’s news hurt everyone; Bowyer, his race team, NASCAR and its fans. It's a bad deal for everyone, and in an effort to prevent it from happening again, perhaps it’s time for NASCAR to change its post-race inspection policy. If there are truly questions that cannot be answered without a complete, fine-tooth-comb teardown, maybe it’s time for NASCAR to stop declaring race winners “all clear” until Tuesday or Wednesday, after a thorough post-race inspection has been done, and done correctly. The days are gone when a competitive NASCAR racecar could be constructed in the back bay of Joe’s Garage. Gone too is the day when they could be properly inspected under a corrugated steel roof in the waning light of day. NASCAR and its fans deserve better. Click HERE to watch ESPN's Ray Evernham give his take on the Clint Bowyer penalty, complete with an explanation of how the violation may have affected Bowyer's #33 Chevrolet. NASCAR has issued penalties, suspensions and fines to Clint Bowyer’s Richard Childress Racing NASCAR Sprint Cup Series team as a result of rules infractions discovered during post-race inspection at the NASCAR Research and Development Center following Sunday’s race at New Hampshire Motor Speedway. The sanctioning body ruled that the car’s body location specifications in reference to the certified chassis did not meet NASCAR-approved specifications as outlined in the 2010 NASCAR Rule Book. Crewchief Shane Wilson has been fined $150,000, suspended from the next six NASCAR Sprint Cup events, suspended from NASCAR until Nov. 3 and placed on probation until Dec. 31. Car chief Chad Haney has also been suspended from the next six NASCAR Sprint Cup events, suspended from NASCAR until Nov. 3 and placed on probation until Dec. 31. Bowyer and owner Richard Childress have been penalized with the loss of 150 driver and owner points, respectively. The penalty drops Bowyer from second in points to 12th at 5040 points, 190 behind leader Denny Hamlin. NASCAR Sprint Cup Series Director John Darby declined to discuss the specifics of Bowyer's violation, citing a possible appeal by the team. However, he told Sirius NASCAR Radio's Sirius Speedway with Dave Moody that the violation was virtually identical to the one discovered a week earlier at Richmond International Raceway. “The #33 car was brought back to the R&D Center after the Richmond race, and we looked it over with the team present," said Darby. "They saw that the measurements were hold-your-breath close. We tried to make it clear to them that the risk was not worth the reward. After that inspection, we had two more meetings with the principals of RCR to take one last, detailed look at the report and tell them, `this is not good, and you need to be careful.'" Braun Racing Nationwide Series driver Brian Scott confirmed to Sirius NASCAR Radio’s Sirius Speedway with Dave Moody today that Turner Motorsports owner Steve Turner now owns the team formerly known as Braun Racing. Scott said he has had no conversations about plans for next season, but that he hopes to sit down with Turner again this weekend. Sources say an official announcement of Braun Racing’s sale to Turner Motorsports is expected later this week. In an era of 42-14 Super Bowls, it’s a rare sporting event that actually lives up to its pre-event hype. Once every 80 years or so, the Boston Red Sox erase a 3-0 deficit to the hated New York Yankees to win the American League pennant, then go on to sweep the World Series. Every few decades, Doug Flutie uncorks an 85-yard touchdown bomb with no time on the clock, or Boise State pulls off the old fumblerooski in overtime to win a major Bowl Game. The 2010 Sylvania 300 was the exception to that rule. The Opening Round of this year’s Chase For The Sprint Cup outstripped even its lofty pre-race hype, delivering a race filled with drama, controversy, upheaval and surprises. Denny Hamlin finished second Sunday to keep his championship hopes alive, but not without dodging a major bullet in the person of Carl Edwards. Edwards chased his car up the banking and into Hamlin’s Toyota on lap 214, sending the Joe Gibbs Racing driver for a spin that dropped him from third to 23rd in the running order. "Can't hold his line, can he," deadpanned Hamlin on his in-car radio, exhibiting a level of confidence that foretold his eventual recovery to the runner-up spot. He heads to Dover this weekend with a 35-point margin over Clint Bowyer. Bowyer established himself as this year’s potential “Cinderella Story,” running up front for much of the day, then taking advantage when Tony Stewart’s dominant Chevy sputtered dry with just two laps remaining. 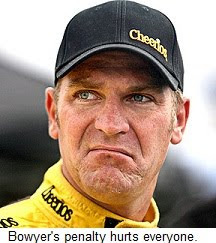 You remember Bowyer, the guy who limped through the back door as the 12th and final Chase qualifier? He’s now a two-time winner in the opening round of the Chase, and three years ago, he rode the momentum of a win at Loudon all the way to third place in the championship standings. His Richard Childress Racing Chevrolet is a title contender once again. For Stewart, it was a day filled with thoughts of what might have been. His failed fuel mileage gamble left him 24th at the finish and 11th in points. He shares the “No More Mistakes Allowed” column with Jimmie Johnson, who drove like a man possessed to overcome a horrendous, 25th-place qualifying effort with several spectacular, three-wide moves on the tight Loudon oval. It was all for naught, however, as his Lowes Chevrolet fell victim to loose lug nuts in the late going that left him 25th in the final rundown. After the race, Johnson deadpanned, "It got a lot more exciting than what I had anticipated." 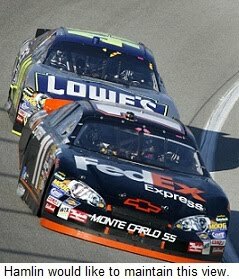 Like Stewart, he has no remaining margin for error in his pursuit of a record fifth consecutive championship. But hey, he’s Jimmie Johnson. He’s not out of the hunt just yet. Kevin Harvick was steady-as-she-goes again at Loudon, finishing fifth on a day when he often didn’t appear to have car enough to do so. NASCAR’s regular-season champion is now just 45 points behind Hamlin as the series heads for the Monster Mile this weekend, and if Hamlin slips even slightly, “Steady Eddie” Harvick will be right there to capitalize. Like he has all season, Jeff Gordon followed closely in Harvick’s tire tracks Sunday, registering a consistent, sixth-place finish that bumped him up three spots to fifth in points. He still hasn’t shown the ability to win races – something this year’s champion will almost certainly have to do -- but he stepped forward while others stumbled, keeping himself in the title hunt for at least another week. Edwards, Greg Biffle and Matt Kenseth were ordinary at best Sunday, showing little to recommend themselves as title contenders. Jeff Burton and Kyle Busch showed flashes of brilliance, but faded to 15th and ninth at the end of the day. Kurt Busch admittedly overdrove his Dodge for much of the day, hitting everything but the Tri-State Megabucks lottery en route to 13th. Like Stewart and Johnson, Edwards, Biffle, Kenseth, Burton and the Busch Brothers will need to step it up a notch at Dover to remain part of the championship discussion. Sunday’s Sylvania 300 at New Hampshire provided a tasty appetizer for the feast to come; a tantalizing glimpse of the drama and excitement that could carry all the way to Homestead-Miami Speedway in the month of November. 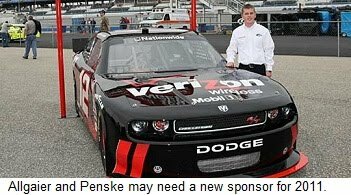 Penske Racing President Tim Cindric has now confirmed what Sirius Speedway first reported earlier this week; that Sprint Cup driver Sam Hornish, Jr., and Nationwide Series star Justin Algaier have no full-time sponsors in line for next season, and are free to explore opportunities elsewhere. 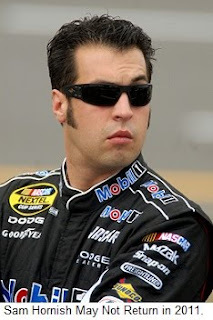 Hornish's Mobil One sponsorship will end at the conclusion of this season to make room for Kurt Busch's new Shell/Pennzoil deal in 2011, while Verizon is currently evaluating its Nationwide program with Algaier and is not expected to return. Cindric also said Penske is still searching for a sponsor for Sam Hornish’s #77 Sprint Cup car, and that Hornish is also free to talk with other teams about next season. In his words, “I wouldn't say anything is for sure, (but) you can't race without the funding. If there are opportunities for him… we're certainly not going to stand in his way as far as furthering his career. But we'd certainly like for him to be able to continue with us." Rusty Wallace told Sirius NASCAR Radio’s Sirius Speedway with Dave Moody today that he is “tired of jacking around, running outside the Top-10," and that he had to make personnel changes to boost the performance of his two-var NASCAR Nationwide Series team. Wallace also said the team could add a third Nationwide Series entry in time for next season. “We have the people, parts, people and resources to do it,” he said. “I’d like to do it if everything comes together (in terms of sponsorship), so we’ll see. It could definitely happen.” He said both Stephen Wallace and Brendan Gaughan will return to the RWR lineup next season. Turner Motorsports owner Steve Turner is set to purchase the Braun Racing NASCAR Nationwide Series team from Todd Braun, with an announcement expected early next week. 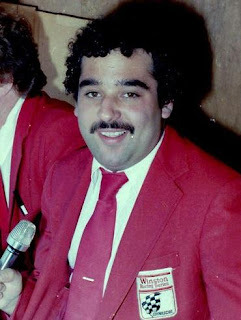 Sources tell Sirius NASCAR Radio’s Sirius Speedway with Dave Moody that negotiations have been ongoing for some time. Turner is expected to continue fielding his current two-truck team on the NASCAR Camping World Truck Series, with the possible addition of a third truck, if sponsorship can be found. 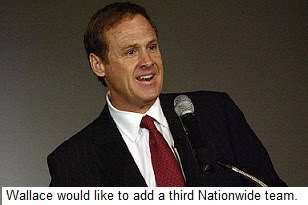 Braun’s current fleet of NASCAR Nationwide Series Toyotas will be converted to Chevrolets during the offseason, with Turner fielding multiple cars on that circuit, as well. Current Turner Motorsports Truck Series drivers James Buescher and Ricky Carmichael are expected to remain with the newly expanded operation, with Braun Racing drivers Reed Sorenson and Brian Scott also expected to continue with the team. Sources say an official announcement could come as soon as Monday. He had negotiated to purchase or merge operations with Randy Moss Motorsports earlier this season, but those talks stalled before a deal could be finalized. Sirius NASCAR Radio's Sirius Speedway with Dave Moody has learned that Brad Parrott has been relieved of his duties as crewchief for Brendan Gaughan’s South Point Resort and Casino Toyota at Rusty Wallace Racing. Parrott joined RWR in February of this year and guided the #62 team to 10th place in Nationwide Series points, with three Top-5 and seven Top-10 finishes in 26 starts. Parrott confirmed his firing today, but declined to comment further. 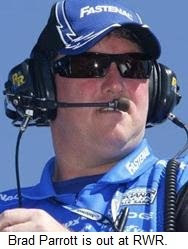 In a telephone conversation earlier today, Rusty Wallace confirmed that veteran Larry Carter has been hired to head up the competition department and “do some hiring and firing to get this team back on track.” He said crewchief Scott McDougall will remain atop the pit box for Steve Wallace. Sources tell Sirius NASCAR Radio's Sirius Speedway with Dave Moody that Verizon will not return to Penske Racing as sponsors of Justin Allgaier’s NASCAR Nationwide Series Dodges in 2011 and that Allgaier has been told he is free to seek employment with other teams next season. Allgaier is currently the top Nationwide-only driver in the standings, ranking fourth in championship points behind Brad Keselowski, Carl Edwards and Kyle Busch. Verizon will reportedly remain with Penske Racing next season, increasing its level of involvement with the team’s IndyCar program. “It’s true that they’re evaluating their NASCAR investment right now,” said Penske Racing Vice President of Marketing and Communications Jonathan Gibson, "and it's true that they may increase their involvement with our IndyCar program." Gibson said Verizon has had "issues surrounding their ability to activate the sponsorship in light of Sprint’s involvement in the sport. Verizon has been hindered in what they can do," he said. "They can’t do much (at the tracks) and they can’t do anything with Sprint Cup Series drivers, which is difficult. "They’ve been very creative in what they have done, and they would like to do more. It’s not the perfect world they’d like to play in, but Sprint obviously does a lot for the sport, so it is what it is." 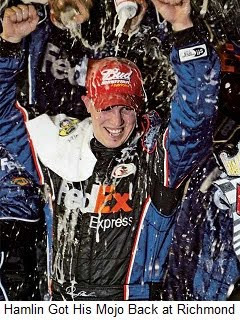 In a season where no driver has been able to establish himself as a clear and lasting favorite for the NASCAR Sprint Cup Series championship, Denny Hamlin’s dominant win in Saturday night's Air Guard 400 at Richmond pushed him to the top of the favorites list for the second time this season. This time he may be able to stay there. 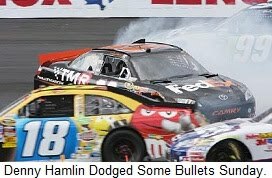 In mid-June, Hamlin and his Joe Gibbs Racing/Fed Ex Toyota team looked like world beaters. Back-to-back victories at Pocono and Michigan – their fourth and fifth wins in the first 15 starts – pushed them to third in the championship standings, just 47 points behind leader Kevin Harvick. They were the hottest team in NASCAR; hitting on all cylinders and serving notice that Jimmie Johnson’s drive for a fifth consecutive title would have to come through them. A 34th place finish on the road course at Infineon, followed by a lackluster 14th at New Hampshire and a 24th at Daytona effectively killed Hamlin’s momentum, and the #11 team spent the next two months trying to get their groove back. There was a brief mojo spotting last weekend at Atlanta Motor Speedway, where Hamlin started on the pole and led seven times for 74 laps in the early going. But a blown engine on lap 143 – an engine JGR insiders now admit they may have “leaned on” a bit too hard in an effort to learn something for the Chase – relegated them to a crushing 43rd place finish. 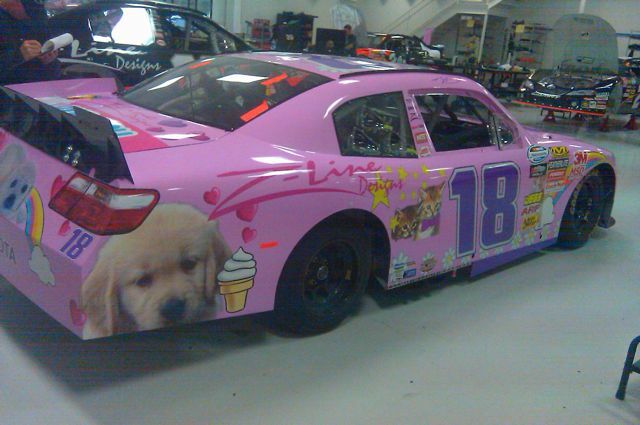 As NASCAR rolled into Richmond last week for the final race of the 2010 regular season, Hamlin and crewchief Mike Ford desperately needed something positive to hang their hats on. Hamlin was a contender from start to finish and a dominator down the stretch, shrugging off a late race challenge from teammate Kyle Busch to claim his sixth victory of the year; breaking a tie with Johnson for most wins and boosting himself into sole possession of the points lead heading into this weekend's Chase opener in New Hampshire. It’s the first time he has ever held the top spot in the points parade, and in Victory Lane Saturday, Hamlin expressed no desire to give it up, ever again. 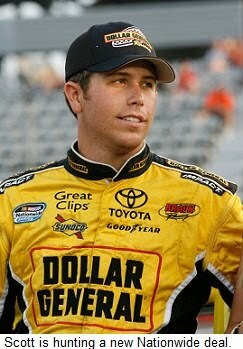 Hamlin’s swagger has not gone unnoticed by the competition. Hamlin enters the Chase with six wins and 10 top-five finishes; both career highs at this point of the season. And if past history is any indicator, the best is yet to come. He has shown a knack for peaking come playoff time, with a career average finish of 9.6 in the final five races of the season. 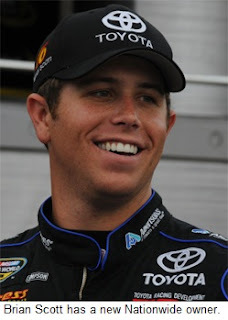 "We spent the last two weeks trying to gauge where we are going to be (in the Chase),” said Hamlin. "We said we were going to try to start our Chase early. That way, when we got to Loudon, we would be in the swing of our momentum, not trying to falsely start it. “I feel like we have done that." If Hamlin and company have learned anything this season, it’s that momentum comes and goes. But their win at Richmond serves notice to all who care to listen that they will be a force to reckon with for the 2010 championship. This time, they’re in it to win it. Four-time NASCAR Sprint Cup Series Champion Jimmie Johnson has chosen MRN Radio announcer Jeff Striegle’s “RacingAwareness.com” as the special recipient in his "Helmet of Hope" program, presenting a $10,000 cash donation to Racing Awareness’ official charity, the Helen DeVos Children’s Hospital Foundation in Grand Rapids, Michigan. Currently in its third year, Johnson’s "Helmet of Hope" program presented by Samsung selects and partners with charities focused on kids. In addition to the $10,000 cash award, the Racing Awareness logo will appear on Johnson's helmet at Auto Club Speedway in California on October 10. The program is also making an additional $20,000 available to one of its 2010 grant recipients, with the winning charity selected in an on-line voting process. One vote per person may be cast each day at www.helmetofhope.org, with voting beginning today at 3 PM Eastern Time and continuing through Wednesday September 29, at 5:00 PT ET. The winning charity will be announced Friday October 1, 2010. 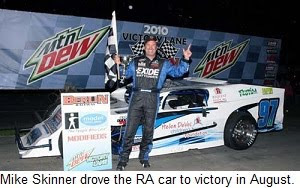 The Racing Awareness team was formed earlier this year to build a modified race car to compete at the Berlin (MI) Raceway, with all winnings donated to charity. NASCAR Sprint Cup Series driver AJ Allmendinger believed in the effort so strongly that he drove the car to Victory Lane on June 15 in front of a huge crowd. Former NASCAR Camping World Truck Series champion Mike Skinner did the same on August 28. Racing Awareness’ goal for the year is to raise $25,000 for donation to HDVCHF in December. With the "Helmet of Hope" gift of $10,000, the team has already raised more than $21,000. In addition to its on-track efforts, Racing Awareness also will also host a charity golf tournament on Monday, September 20 at Thousand Oaks Golf Club in Grand Rapids, MI. Sirius NASCAR Radio's Sirius Speedway with Dave Moody has learned that NASCAR Camping World Truck Series driver Jack Smith has been suspended indefinitely from NASCAR after being arrested and charged with three felony counts of fraudulently attempting to obtain a controlled substance in Wentzville, Missouri last month. NASCAR was reportedly informed by Wentzville Police on July 23 that Smith had been arrested the previous day after allegedly attempting to obtain a controlled substance by fraudulent means on July 11, July 14 and July 22, 2010. Kyle Busch's #18 Joe Gibbs Racing "Toyota Sponsifier" car is prepped and ready to load into the transporter for Friday night's NASCAR Nationwide Series race at Richmond International Raceway. You've got to love the puppies, kitties and ponies! And just wait until you see Kyle's pink firesuit! 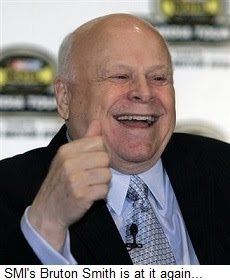 Speedway Motorsports Inc. Chairman Bruton Smith took another verbal shot at Homestead-Miami Speedway this weekend, saying the South Florida oval is "not the proper place for the Sprint Cup Series to end the Chase for the Championship” and referring to the track as "North Cuba." Now a disclaimer, in the interest of full disclosure. Sirius Speedway is produced by MRN Radio, which is a division of International Speedway Corporation. ISC is Smith’s major competitor among speedway operators and owns Homestead-Miami Speedway. ISC also pays my paycheck, meaning that – ostensibly at least -- I could be viewed as having a dog in this fight. If you choose to disregard my views on this subject as being biased, you are certainly entitled to do so. I have the utmost respect for Bruton Smith. His years at the helm of SMI have produced a string of showplace speedways from coast to coast, and his efforts have played a major role in making NASCAR what it is today. Unfortunately, his propensity to shoot from the lip with no regard for the consequences has also damaged the sport from time to time. Smith has a right to his opinion, and he is free to express it. However, I cannot recall another track operator criticizing the competition the way Smith consistently trash-talks Homestead-Miami Speedway. His recent comments go beyond mere professional rivalry. They are personal and hateful in nature, damaging Homestead-Miami Speedway, its community and the sport as a whole, for no apparent reason. Bruton Smith knows what he wants, and he has never been one to compromise. When faced with a difference of opinion, the SMI Chairman generally reacts with all the subtlety of a bulldozer, plowing his way through the opposition using any methods at his disposal. Smith has been around long enough to understand the value of public opinion, and he knows from experience that if he says something frequently enough – and loud enough -- people will eventually begin to believe it. That’s why he stood before a group of reporters recently and claimed, “The media wants the final race of the season in Las Vegas.” The media -– like NASCAR fans in general -- is deeply divided on the topic, and Smith knows it. He also knows that when his comments hit the newspapers, large numbers of NASCAR fans would accept them as gospel truth. That’s also why Smith stands on the frontstretch at Las Vegas Motor Speedway each season exhorting fans to “raise up your hands and tell NASCAR you want two races here next year,” despite knowing the decision to being a second race to Vegas is wholly his, and not NASCAR’s. Smith is not the eccentric uncle in rose-colored glasses he often portrays himself to be. He understands that Miami is not “North Cuba,” and he is able to differentiate between a thriving, energetic South Florida community and the backward, economically desolate communist state less than 250 miles to its south. In the end, the SMI Chairman is saying whatever it takes to cast Homestead-Miami Speedway and its community in a negative light, for his own personal gain. One can only imagine the hubbub that would ensue if Smith's counterpart -- ISC's Lesa France Kennedy -- were to chastise Smith and former New Hampshire Motor Speedway owner Bob Bahre for stealing races from longtime NASCAR fans at North Wilkesboro Speedway a decade or two ago, and moving one of those races to "North Mexico:" Texas Motor Speedway. The response would be swift and indignant, as it should be. Why, then, does Smith get a free pass on his comments? At worst, they are borderline racist in nature. At best, his comments are needlessly insulting to a speedway, a fan base and an area that have worked hard to make Ford Championship Weekend a success. That is unfortunate, to say the least. The last time NASCAR entered its Chase for the Sprint Cup with this many unanswered questions was… well… never. In fact, the 2010 edition of NASCAR’s playoff season appears to be the most unpredictable yet, with no less than a half-dozen legitimate title contenders. Kevin Harvick has been like the Rock of Gibraltar this season, combining the consistency needed to stay atop the point standings with an ability to win multiple races. After nearly leaving Richard Childress Racing a year ago due to unhappiness with the team’s performance, Harvick looks like a new man in 2010. He is happy, confident in his equipment and supremely focused on the job at hand. Make no mistake about it, the road to the Sprint Cup championship will lead through RCR’s Welcome, NC, shops. Jeff Gordon has done everything but win this season, and aside from a map to Victory Lane, he and crewchief Steve Letarte have everything they need to contend for the championship. Consistency has been their stock in trade this season, but consistency alone will not be enough to earn them the Sprint Cup. Gordon must win races to be a legitimate title contender, and there’s no reason to think that he won’t. The DuPont Chevrolet has been too close, too many times to go 36 weeks without a checkered flag. Defending series champion Jimmie Johnson has appeared downright vulnerable in recent weeks, plummeting to the bottom half of the Top-10 and failing to crack Victory Lane since a late-June win at New Hampshire Motor Speedway. Has the Lowes Chevrolet team finally lost its Golden Horseshoe? Or has crewchief Chad Knaus spent the last two months experimenting with new setups for the Chase? A solid, third-place finish at Atlanta Motor Speedway Sunday night provided a much-needed surge in confidence, and if you think Jimmie won’t be a factor for his fifth consecutive Sprint Cup title, you haven’t been paying attention in any of the past four seasons. Both Kurt Busch and Denny Hamlin briefly wore the mantle of “Most Likely To Dethrone Jimmie” this season, but neither have shown the consistency necessary to actually get the job done. It will take more than a two or three-race hot streak to prevail in the upcoming Chase. In fact, Johnson’s past performance indicates that a Top-5 average finish may be required during the 10-race stretch, in addition to two or three wins. Can Busch and Hamlin regain their lost momentum? Right now, it appears not. But things can change, and fast. After Race 11 of the season at Darlington, Tony Stewart looked like the walking embodiment of the Sophomore Jinx. He was 18th in points, running horribly and looking like nobody’s bet for a Chase berth. Since then, his Stewart-Haas Racing team has strung together 11 Top-10 finishes in 14 starts -- including an impressive first win at Atlanta -- and climbed from 18th to fourth in points. He’ll begin the Chase with a bit of a deficit to both Johnson and Hamlin, but if Smoke can continue his remarkable string of Top-10 finishes and win another race or two, he could be a title contender. "At this stage last year, we were pointing downhill," said a confident Stewart after his Atlanta victory. "Now we're pointing uphill." If Stewart’s start to the 2010 season was bad, Carl Edwards’ was horrendous. As recently as New Hampshire in late June, Edwards was locked in a nip-and-tuck battle with Dale Earnhardt, Jr. just to make the Chase. But while Junior faded, Edwards surged, putting together seven Top-7 finishes in his last eight races to climb to fifth in points and clinch a spot in the playoffs. He’s still not winning races – his last victory came in the final race of 2008 – but Edwards is clearly peaking at the right time. Jeff Burton, Matt Kenseth and Greg Biffle have had similar seasons; quiet but steady. With only one win between them, they’ll have to make a little more noise in the Chase if they hope to be true title contenders. But veteran drivers generally find a way to get the job done come title time, and all three are capable of seizing the postseason momentum with a win in the early weeks of the Chase. And finally, can Kyle Busch finally find the consistency necessary to be a title contender? NASCAR’s most controversial driver folded like a house of cards in last year’s Chase, but lessons learned in 2009 may serve him well this season. He obviously has the ability to string together multiple wins come Chase time, but his all-or-nothing style leaves him prone to occasional finishes in the back of the pack. Kyle is just one of many unanswered questions with the 2010 Chase looming less than two weeks away. Last Sunday night's Emory Healthcare 500 at Atlanta Motor Speedway provided a good look at what may lie ahead. Five different Chase drivers took a turn at the front of the field, with some falling victim to various maladies -– blown engines, cut tires, pit road miscues and the like -- while others stepped forward to contend for the win. Expect more of the same in the Chase, with multiple drivers taking their shot at the Brass Ring, but only one ultimately able to grab hold. The Las Vegas odds makers still have Johnson as the man to beat, but even the four-time defending champ admits that this is anyone’s title. "When you look around... we're going to have a really exciting Chase," he said. "There are a lot of teams coming together right now." 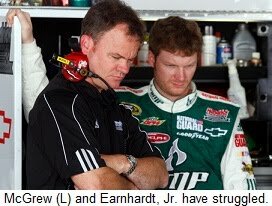 Despite Dale Earnhardt, Jr., almost certainly failing to make the Chase For the NASCAR Sprint Cup for the second year in a row, Hendrick Motorsports owner Rick Hendrick says he has no plans to replace Lance McGrew as crewchief of Earnhardt’s #88 AMP Energy Drink/National Guard Chevrolet. 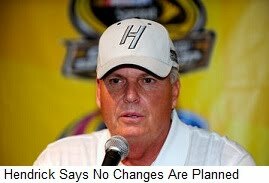 Hendrick has pulled the trigger on high-profile crewchief changes before, replacing Robbie Loomis with Steve Letarte on Jeff Gordon’s pit box in September of 2005 and installing McGrew as Tony Eury, Jr.’s replacement in May of 2009. But for now, at least, Hendrick says the problem with the #88 team is not its crewchief. He also said the team’s complete 2011 sponsor lineup should be announced within the next 60 days. He declined to comment on DuPont’s continuing level of involvement, after reports surfaced recently that the longtime HMS sponsor is looking to scale-back its involvement beginning in 2011. 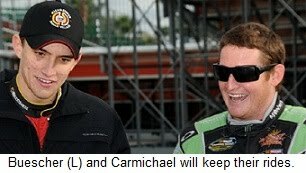 He confirmed published reports that Quaker State has signed a new, three-year contract extension to remain with the team through 2013; including four races as primary sponsor of Mark Martin’s #5 Chevrolet next season. Quaker State will also continue as an associate sponsor on all four HMS Chevys for the next three years.